Finally, part 2 of Skyland season 1 is finally here that once again returns us to this classic tale of good versus evil which is also a social commentary of this futuristic world. For the uninitiated, the world of Skyland revolves around a plethora of broken pieces of the planet Earth, each supporting life as somehow the core of the planet is still active. Set 200 in years in the future, mankind have evolved into a new type of homosapians called the Sejins who have the ability to absorb sunlight and with this comes superhuman powers. Unfortunately for "mankind", a dictatorship called the Sphere has been controlling the water supply for the Sejins and their enforces called the Guardians control this precious resource. Early in the series, Mahad and his 12-year old sister Lena were caught in a war to usurp the Sphere and this is where the series once again reunites the viewer. In part 2, Mahad and Lena are on the run from the Sphere as they warn others in their path and I must admit that the second half of the series is considerably more action orientated. New characters are introduced and existing characters make a welcome return that leaves the viewer wondering just what on Earth is going to happen. 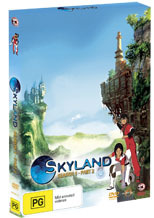 With abductions and ghost ships, Skyland Season 1 Part 2 truly compliments the original episodes as questions are finally answered that leads to the epic conclusion of this amazing animated and CGI series. With stunning video and audio quality, this is truly an epic anime series that can be watched by people of all ages.